Each of our mouse pads are proudly made in the USA at our Scottsboro, Alabama facilities with sharp, colorful graphics. The pads measure 9" in width by 7 3/4" in height and are 1/4" thick. This Airborne... By Donkey?!? mouse pad features Staff Sgt. 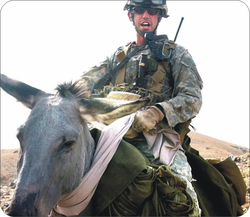 Matthew Sheppard from the 325th Airborne Infantry Regiment, patrolling Lwar Kowndalan, Afghanistan by donkey . Photo taken October 13, 2005 by Spc. Mike Pryor and is courtesy of the U.S. Army.